The question on the table today, is bigger really better? The quick answer is almost always yes, especially when it comes to things like throttle bodies. I mean really, doesn’t a larger throttle body flow more than a smaller one (of equal design)? True enough, the larger 102-mm FAST throttle body certainly flowed more than the smaller 92-mm throttle body in our test, but does that make it better? I guess the real question here is not about bigger being better, but rather is bigger really necessary? You see, just because a simple flow device like a throttle body flows more air, doesn’t mean that extra airflow will translate directly into power. The complex airflow pump that is the internal combustion engine can only process so much air. Just because we improve the flow potential of one component does not mean we have improved the flow rate of the entire combination. In this case, more flow does not always equal more power. If you don’t get any more power, why spend the money for something you might not need? Our test motor started out life as a 2008 LY6 featuring Variable Valve Timing (VVT), LS3-style rec-port heads and a drive-by-wire throttle body. The factory LY6 intake was replaced by the low-profile, factory LS3 intake. 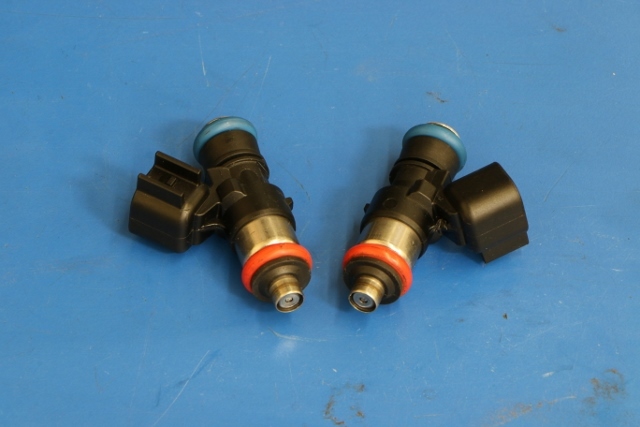 We also replaced the factory LY6 injectors with these 89-pounders from FAST (for later boost runs). The stock VVT cam was replaced by a COMP 54-469-11 cam. 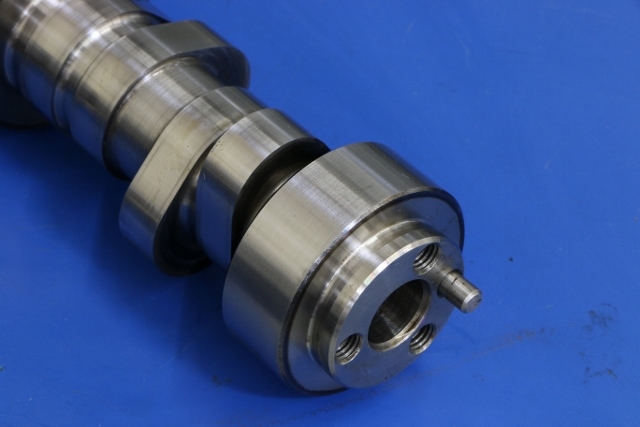 The healthy 469 cam offered a .617/.624 lift split, a 231/243-degree duration split and 113 lsa. 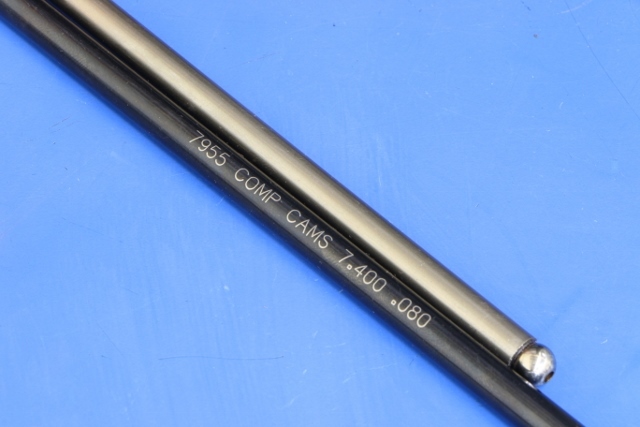 We also took the liberty of replacing the stock pushrods with hardened versions from COMP Cams. 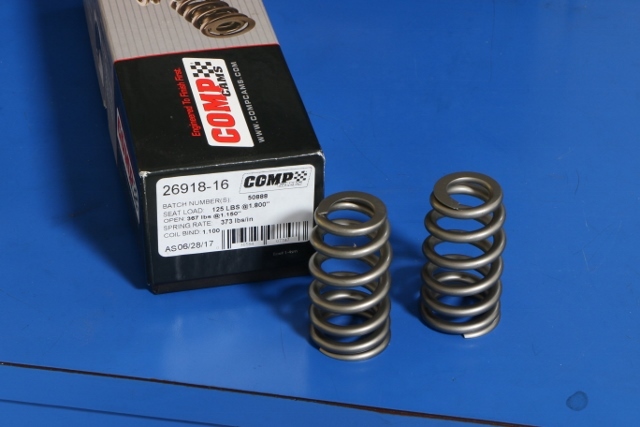 The cam swap required replacement of the stock LY6 valve springs on the rec-port 823 heads. To illustrate this concept in action, we set up a test on our modified 6.0L LY6. For those unfamiliar with the various LS designations, the LY6 was an iron-block, aluminum-headed 6.0L. The Gen 4 LY6 differed from the previous Gen 3 LQ4 and LQ9 versions by way of the use of LS3-style, rectangular-port (823) heads and matching intake. To further improve power, the LY6 also featured Variable Valve Timing (VVT) and slightly higher compression. 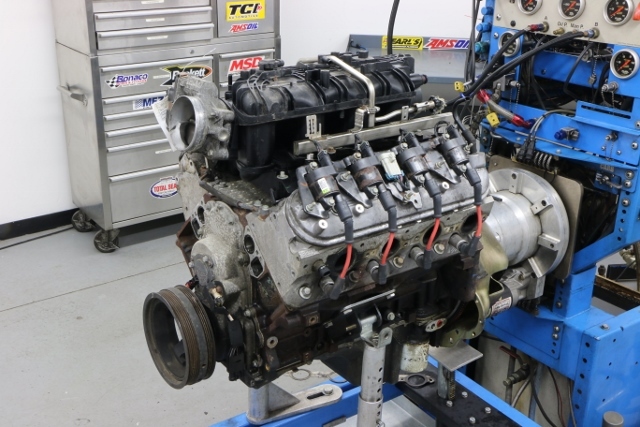 For our throttle body test, the high-mileage LY6 motor (from a local LKQ Pick Your Part) was further upgraded with a low-profile, LS3 intake, larger injectors and a healthy COMP cam. The 54-469-11 cam offered a .617/.624 lift split, a 231/243-degree duration split and 113 lsa. 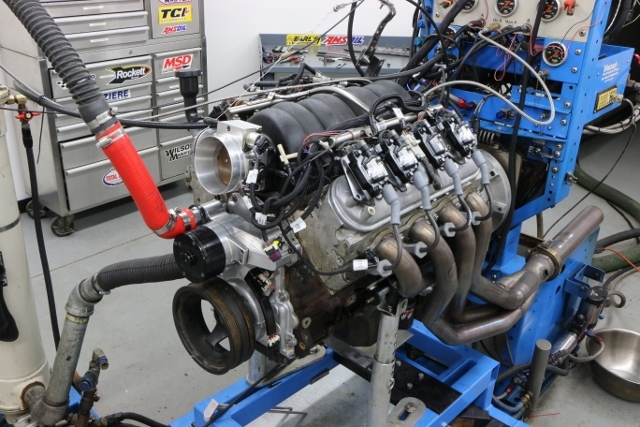 The cam was teamed with a set of 26918 valve springs, long-tube headers and a FAST XFI management system. The idea was to run this modified 6.0L first with the 92-mm throttle body on the factory LS3 intake, then again with the larger 102-mm throttle body using an ICT 92-102-mm adapter supplied by Summit Racing. Equipped with the 92-mm FAST throttle body, the modified LY6 produced 546 hp at 6,600 rpm and 494 lb-ft of torque at 5,200 rpm. 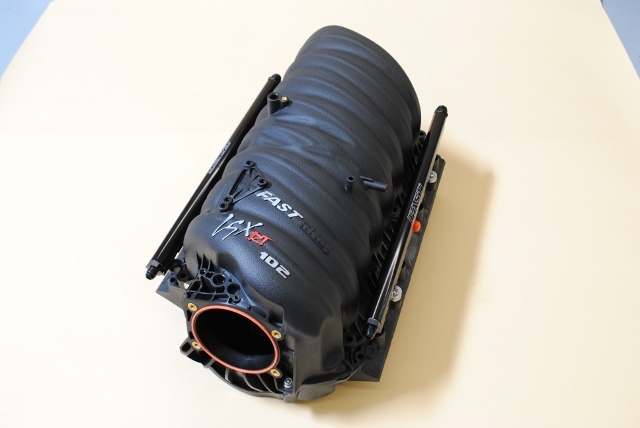 The factory LS3 was designed to accept the stock, GM 90-mm throttle body. 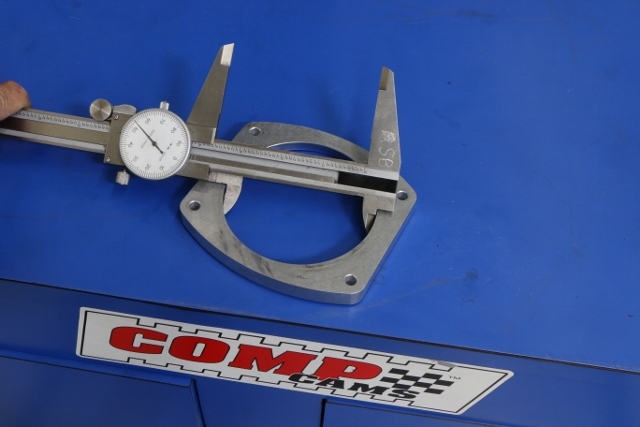 The throttle body opening actually measured 3.698 inches (nearly 94 mm). To get things started, we installed the FAST 92-mm throttle body on the stock LS3 intake. Run with the FAST 92-mm throttle body, the modified 6.0L LY6 produced peak numbers of 546 hp and 494 lb-ft of torque. The FAST 92-mm throttle body measured 3.540 inches in diameter, considerably smaller than the nearly 3.70-inch opening in the LS3 intake. We couldn’t help but wonder if there was more power to be had from a larger throttle body? 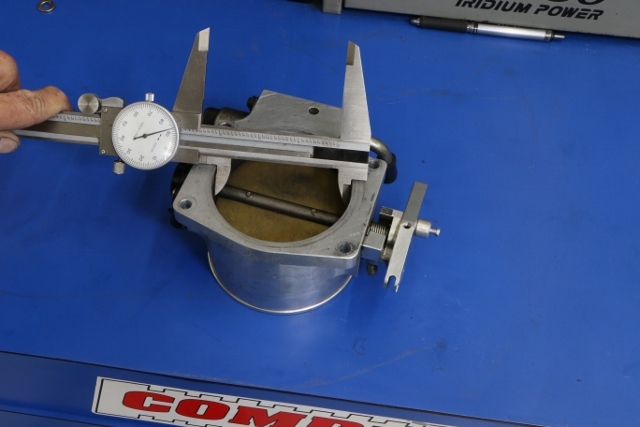 To find out, we decided to run a larger 102-mm FAST throttle body using this 92-102-mm adapter from Summit Racing. The adapter came complete with longer mounting bolts to secure the throttle body through the adapter. 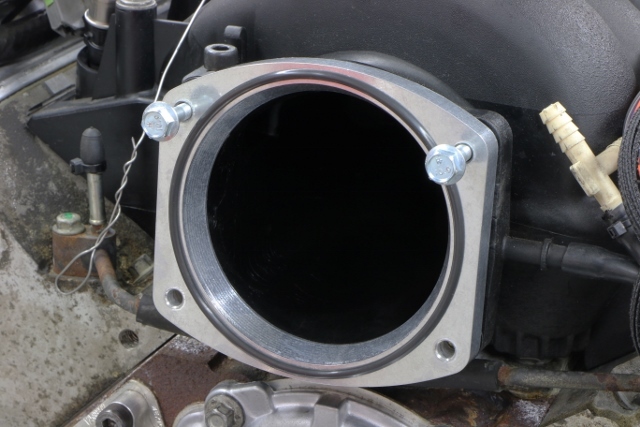 Using the adapter, we installed the FAST 102-mm, Big-Mouth throttle body. 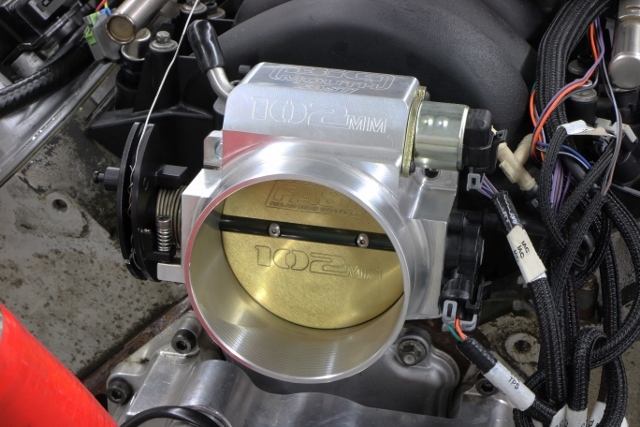 The 102-mm throttle body will come in handy once you decided to get serious about power production or utilize an intake, like this Fast LSXRT, designed to accept a 102-mm throttle body. 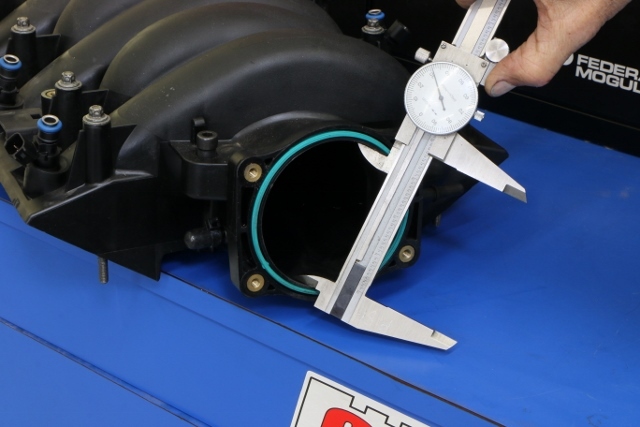 Before getting to the throttle body swap, a few important measurements are in order. 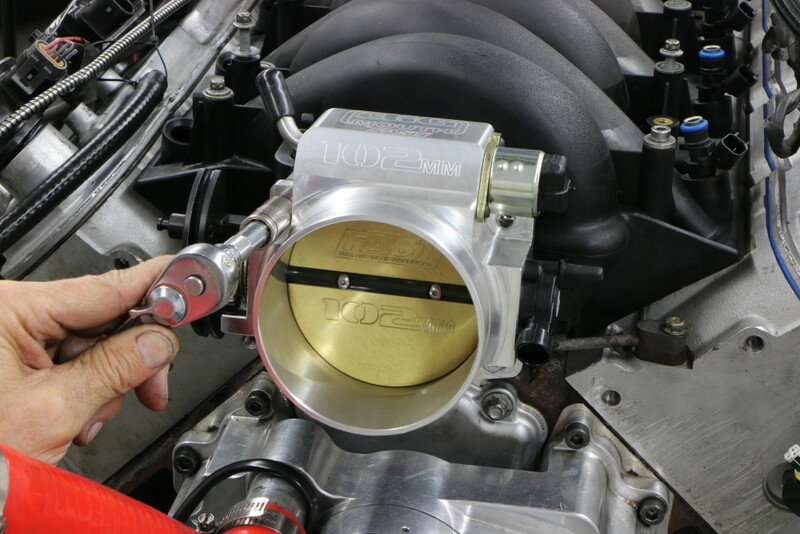 The factory LS3 throttle body featured a throttle opening designed for use with the stock 90-mm DBW throttle body. The throttle opening in the LS3 intake actually measured 3.698 inches. This is important since it was larger than both the factory 3.450-inch throttle body (all measured from the back side) or, the 3.540-inch FAST throttle body run for this test. We couldn’t help but wonder if the modified 6.0L might benefit from a larger throttle body to maximize the airflow of the larger throttle opening? 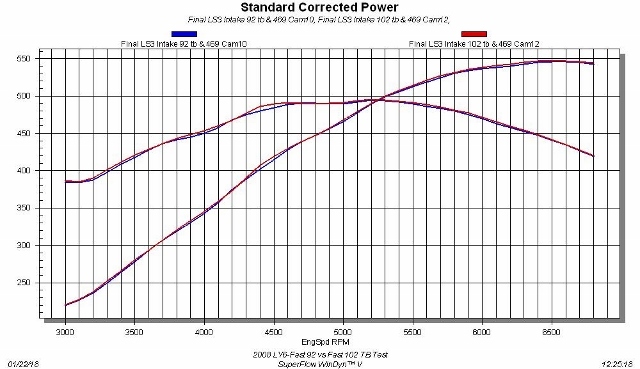 To test the theory, we utilized a 92-102-mm adapter supplied by Summit Racing. This adapter allowed us to bolt on the larger 102-mm FAST Big-Mouth throttle body and provide a smooth transition for the air flow to the opening into the LS3 manifold. Installation was simple using the longer mounting bolts supplied with the adapter. Once installed, the throttle body upgrade had almost no effect on the power output of the modified 6.0L, with peaks of 547 hp and 495 lb-ft of torque. The flow rate of the 92-mm combination was obviously more than adequate for the needs of 545-hp 6.0L, showing you need either more motor or a different intake to take advantage of the massive flow rate of a 102-mm throttle body. 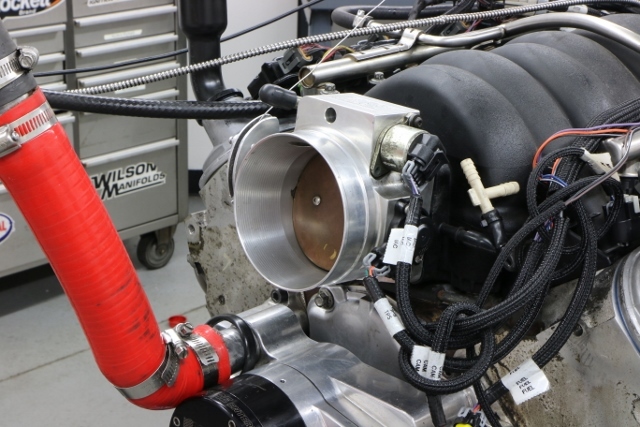 To illustrate whether a larger throttle body is really necessary on a mild 6.0L application, we set up a test on an LY6 equipped with a COMP 469 cam, long-tube headers and an LS3 intake. The LS3 intake was designed to accept the factory 90-mm DBW throttle body, but we equipped it first with the FAST 92-mm throttle body, then stepped up to a larger 102-mm Big Mouth using an ICT TB adapter supplied by Summit Racing. 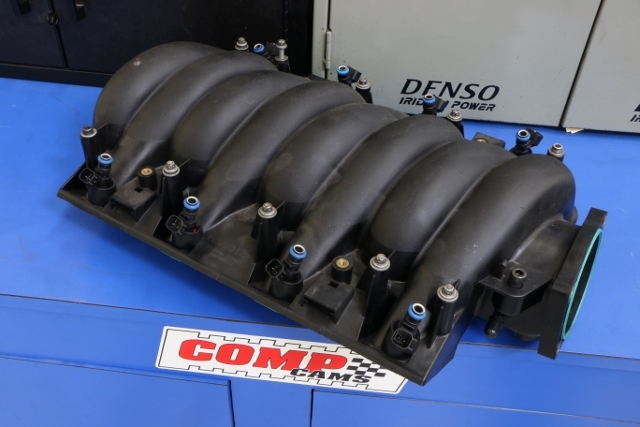 These dyno results clearly show that the FAST 92-mm throttle body offered more than sufficient flow to feed the needs of the 545-hp 6.0L LY6. The adapter and 102-mm throttle body offered little or no gain on this application. You are going to need either more motor or an intake (like the FAST LS3), that comes with a 102-mm throttle opening, to take full advantage of the flow potential of the larger throttle body. 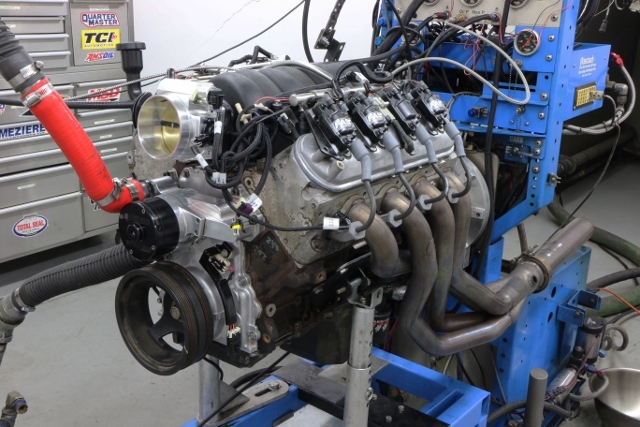 Run on the dyno with the larger throttle body, the modified LY6 produced 547 hp and 495 lb-ft of torque. As is evident by the power curves, the motor (or intake) simply could not utilize the extra airflow offered by the larger throttle body.